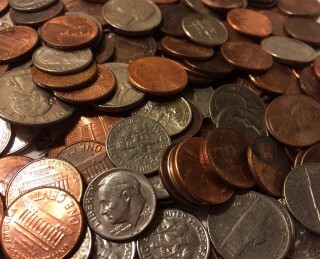 Don't clean your coins – This one sounds like a no-brainer to many of you out there, but when I was 11 years old and first getting into coin collecting, I thought bright, shiny coins looked better than dirty, dull-looking coins. I had a different view when I saw the horrid results of these cleanings on vinegar-and-baking-soda-bathed Lincoln wheat cents and toothpaste-scrubbed silver coins. I soon learned that collectors really prefer coins to have their natural, aged patinas. I quickly embraced this outlook, too. Be careful buying from coin dealers you're not sure about – Ever see advertisements for coins somewhere, but you're not sure if you should trust the coin dealer or not? When I was about 14, I put a rather large order in for some coins from a mail-order coin dealer who is no longer in business – and never received the coins I bought. My parents helped me file a report with the Better Business Bureau in the coin dealer's state of operation, but it never helped me recover the lost funds. What’s the short version of this otherwise long story? Make sure you only buy from coin dealers who have longstanding reputations and affiliations with at least one or two major coin organizations. I’m not saying that new coin dealers with no organizational affiliations are unscrupulous – but it helps to find coin dealers whose business practices can be verified. You might also consider placing a small “test” order with a coin dealer before laying out the big bucks. Thankfully, the vast majority of coin dealers would never even think of taking your money and running. Don't buy rare coins solely to make money – For a long time, I was really into collecting Lincoln cents. Of course, the top trophy any Lincoln cent collector can have is the 1909-S VDB penny – an expensive coin by most measures. Thankfully, I only buy rare coins because I want them, not because I'm trying to profit from them. But, get this: I happened to buy the much-storied 1909-S VDB Lincoln cent just as the Great Recession was hitting the coin industry. So, my 1909-S VDB cent actually lost value, and by a couple hundred dollars easily. More seasoned coin collectors will remember a scenario in which the rare coin market sustained massive losses in the early 1990s as investors sold their rare coins following the end of Wall Street-fueled speculation in the coin industry. My coin collecting allowance was way too small to buy any of those deflated rare coins, but I surely wish I had. It was an era when Good-4 Draped Bust dollars were selling for $350 each, Saint-Gaudens double eagles could be bought for $400, and $1,000 could easily purchase an entire 20th century type set (no gold) with all the coins in uncirculated condition. Meanwhile, gold and silver prices were down, and I remember being able to buy American silver eagles for less than $7. Not bad, huh? Don't sell coins you really wish to keep – I've sold more than a few beloved coins over the years simply to add a little cushion to my savings account. Sure, expensive coins don't feed, clothe, or provide shelter by themselves. But we all have certain coins that we simply love. Unless you're in a situation where you need to sell your coins to keep the lights on (and I wasn't faced with such dire consequences), keep your coins. You don't want to suffer what I call "seller's remorse." Do you have any coin collecting lessons that you've learned over the years? Feel free to share your insights below in the comments section. I'd be glad to hear what you've learned from your experiences as a coin collector!